Fadel Tamimi thrusts his smartphone into my face to show me a gory video of doctors removing a bullet from his 15-year-old sonâ€™s head. The rubber-coated metal bullet was lodged in Mohammed Tamimiâ€™s skull after an Israeli soldier shot him in the face from close range in December 2017. The video is incredibly jarring. Despite my discomfort, I am unable to look away from the tiny screen. Around us, the Sandton MediClinic smells strongly of disinfectant. Itâ€™s midday on a Wednesday, and the clinic abuzz with activity: cleaners tinker, nurses chatter, patients and visitors bustle in and out. It is here that I meet with Mohammed, his older cousin Osama, Fadel and Nadia Meer. Meer is the director of Palestinian activism NGO 2 Suns Shamsaan. 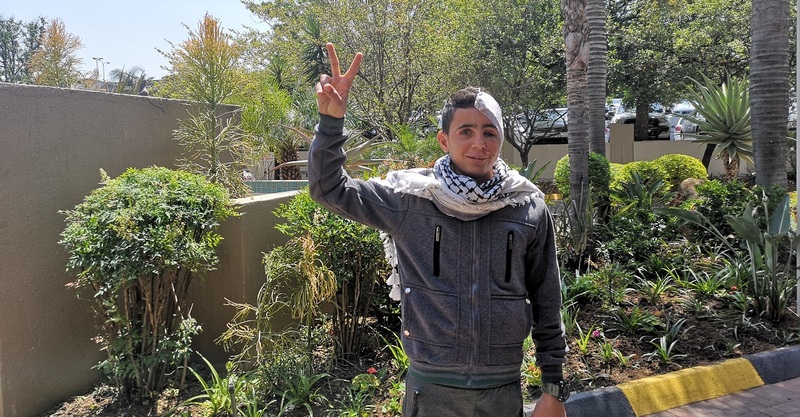 Mohammed is in Johannesburg to undergo facial reconstruction surgery following complications with his surgery in Palestine. 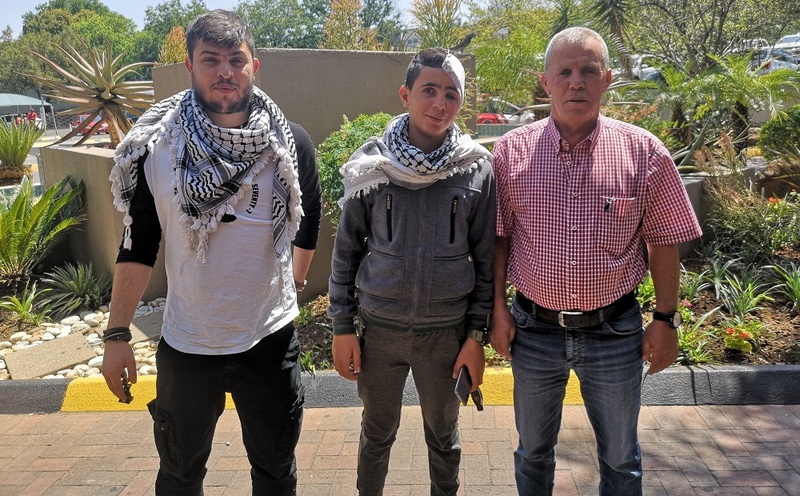 The Tamimis – Mohammed and his cousins – are well-known activists in the little village of Nabi Saleh in the West Bank in Palestine. His cousin Ahed Tamimi was jailed after a video of her slapping an Israeli soldier went viral, and his other cousin Janna Jihad is the youngest card-carrying journalist in the world. Who is Ahed Tamimi and why should South Africans care? The five of us sit tucked into the MediClinicâ€™s cafe. Mohammed and Osama sip iced coffee, a standard favourite it seems. Mohammed looks like any other teenage boy: heâ€™s wearing a gray tracksuit and a keffiyeh, heâ€™s quite preoccupied with his smartphone and heâ€™s got that mischievous nonchalance that only teenagers can pull off. The difference is the white bandage and stitching that cover the left side of his face. I ask Mohammed to paint me a picture of what his life in Nabi Saleh is like. He speaks through Osama who is the only Tamimi present that speaks English. Mohammed and his father speak Arabic. Like most teenagers, Mohammed loves football. He tells me he plays defence and that Cristiano Ronaldo is his favourite player. His face is animated when he speaks of football, but he has a different expression when he speaks of school. â€œI wake up very early to go to school,â€ Mohammed says. He rises at 5:30 am every morning to attend school which is 6 km from his village. There are no checkpoints between the village and the school, there is a checkpoint on the main road. Usually Mohammed waits on the street for a taxi service to take him to school but when the Israelis close the main road and set up a checkpoint, no cars are allowed to pass. â€œYou donâ€™t know if there is a checkpoint or not so you always have to wake up early,â€ he says. I ask Mohammed if he likes school, he makes a gesture to show me â€˜sort ofâ€™. Fadel interrupts this saying, â€œno, noâ€ and tells Osama to tell me that Mohammed is not interested in school. We all laugh. Itâ€™s clear that Mohammed is the family jokester. Throughout the interview, Mohammed puts on a brave face. You would never imagine how he skirted death. I was hesitant to ask about Mohammed of his injury but was persuaded by Meer and his father. Meer tells me his father encourages him to be strong, and to confront his battles head on saying perhaps thatâ€™s why he has made such a good recovery. Children who live under occupation donâ€™t enjoy the privilege of being treated gently, they must endure. Mohammed tells the story detachedly in Arabic, but the faraway look in his eyes betrays his anguish. Iâ€™m torn between wanting to tell of his injustice and the the guilt I feel to have him relive his painful memory. The day Mohammed was shot was like any other day. It was late afternoon and he was playing football with his friends. But on this day, US President Donald Trump announced his highly controversial decision to move the US embassy from Tel Aviv to the Holy City of Jerusalem. The Israeli Defence Force (IDF) expected reactions from Palestinians and were stationed on the streets. That day Palestinians went into the streets to demonstrate their rage. â€œClashes happened in my village,â€ Mohammed says. â€œWhile we were playing football, we heard the sounds of gunshots and teargas. And suddenly, the sounds of the gunshots and everything just stopped. We were worried that someone was injured or arrested because thatâ€™s what it [the silence] usually means. We went to a place in the village where there was a high building, I climbed the wall around it. I wanted to see if someone got arrested,â€ he says. An Israeli soldier was hiding on the other side of the wall. Thatâ€™s when the soldier shot Mohammed. The friends he was playing football with carried him onto the main street to look for help. There was blood everywhere. Two men parcelled Mohammed into a car and took him to a small clinic in the next village. The clinic wasnâ€™t equipped to help him. They put him in an ambulance and took him to another clinic. Osama explains how Mohammedâ€™s surgery had the whole village scrambling. He needed a blood transfusion but because he had a rare blood type and the clinic was new with no blood bank, the whole village was donating blood to see if they had a match. â€œEven the Palestinian army came, and eventually someone had a match. You should have seen the hospital, there was like 300 people there donating blood for him,â€ Osama says. After some tests at the next clinic, they immediately performed surgery. It took six hours for the doctors to remove the bullet from Mohammedâ€™s face. Itâ€™s a miracle that he survived. Doctors were unsure if Mohammed would suffer brain damage. After a week in an induced coma, and another two in the hospital Mohammed was eventually allowed back home. Following the surgery, Mohammed had trouble with his vision as well as seizures and anxiety. But luckily, thereâ€™s no sign of brain damage. The left side of Mohammedâ€™s head is concave. Meer first met with Mohammed and Osamaâ€™s cousins Ahed and Janna when she was working in Palestine with Shamsaan. Earlier this year, Janna was in South Africa over the Mandela centenary as the ambassador of Shamsaan. Shamsaan was created to draw attention to the child prisoners in occupied Palestine. While Janna was in South Africa, Mohammed wrote a Facebook post desperate for help. In the post, he said he wanted to be as he used to be before. Meer answered his call. She rounded up plastic surgeon Dr Ridwaan Mia who volunteered to perform surgery on Mohammed. â€œIn Palestine they did life-saving surgeryâ€, Meer explains. Clinics there have different priorities and are vastly under-resourced, she adds. Shamsaan wanted to help Mohammed regain as much normality as possible, and to help him her his vision back. â€œI am happy I did the surgery, I am back to how I used to be,â€ Mohammed says, â€œI can see betterâ€. After his surgery, his vision returned immediately. â€œI am thankful to everyone who helped with the surgery but I feel bad for the other Palestinian children who had similar things happen to them and could not travel and get help,â€ he says. It isnâ€™t normal for a teenager to be shot in the face with a rubber bullet. But then life under occupation is anything but normal. I ask Osama and Mohammed what itâ€™s like growing up in occupied Palestine. â€œItâ€™s not normal if you donâ€™t hear a gunshot,â€ Osama says. I ask if any of them can remember the first time they heard a gunshot. â€œI must have been about six in 2009, thatâ€™s the first time I remember hearing a gunshot,â€ Mohammed says. Osama cannot remember. Gunshots, tear gas, rubber bullets, and stun grenades are ordinary for Palestine’s youth. â€œWe can arm and disarm a tear gas canister,â€ Osama explains. â€œThe Israeli army makes some kind of mine with the the teargas and stun grenades. They put stones on it and remove the safety pin. So what happens is when you remove the stone, teargas or stun grenades will explode. We learned how to remove the stone and put the safety pin back so it doesnâ€™t explodeâ€. When he realises what weâ€™re talking about Mohammed tells Osama: â€œI want to show herâ€. He pushes his phone into my hands and this time he shows me a picture of him as a little boy in a green shirt, showing a peace sign to armed IDF soldiers. Itâ€™s a rattling photo, I am torn between thinking it is brave and thinking it is foolish. Osama is no stranger to trauma either. The 23-year-old is ‘Palestinian supermom’ Manal Tamimiâ€™s eldest son. He tells me he suffered 18 days in an interrogation centre after being kidnapped by the Israeli army. They asked him all sorts of things. â€œThey wanted names of who participates in throwing stones and things like that. They said we know youâ€™re dealing with weapons and we know you planned to kill a soldier. It starts like that. Youâ€™re so scared. Eventually you just say okay to make it stop,â€ Osama says. He says he canâ€™t believe he actually went through what he did. â€œI would give anything not to go through what I went through,â€ he says. But violence is normalised for the youth of occupied Palestine. â€œThis generation is not scared,â€ Osama says. â€œWe are the generation who lived through the second intifada. We were born when violent clashes were super normal,â€ he says. â€œWhen they start terrorising us, it works in opposite ways: it makes us start thinking of new methods of resistance,â€ Osama finishes.